Uniform of the Day: Dress for possible hot & humid weather, wear comfortable shoes; bug spray to deal with possible ticks, etc. Tour Features: As Robert E. Lee’s Army of Northern Virginia pushed north towards Pennsylvania in the summer of 1863, J.E.B. Stuart’s Cavalry was assigned to screen the army. Meanwhile, Union Cavalry commander, Alfred Pleasonton, was ordered to penetrate the Confederate screen. 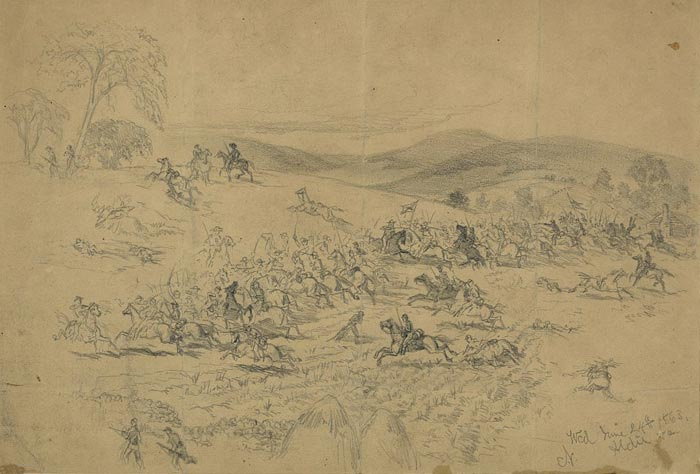 The result was the Cavalry Battles of Aldie, Middleburg, and Upperville in Loudoun Valley. Join us for the Spring Tour, sponsored by the Bull Run Civil War Round Table, featuring Kevin Pawlak as tour guide with planned visits to these key preliminary cavalry battles on the road to Gettysburg. Additionally, experience visits to some John Mosby Civil War sites. PoC: Scott Kenepp dsk22264@comcast.net cell: 703-624-4995.